ClearIAS Current Affairs Capsule March 2019 (the latest monthly MCQs PDF) is released. You can now download the Monthly MCQs eBooks (PDFs) for FREE from the ClearIAS Store. 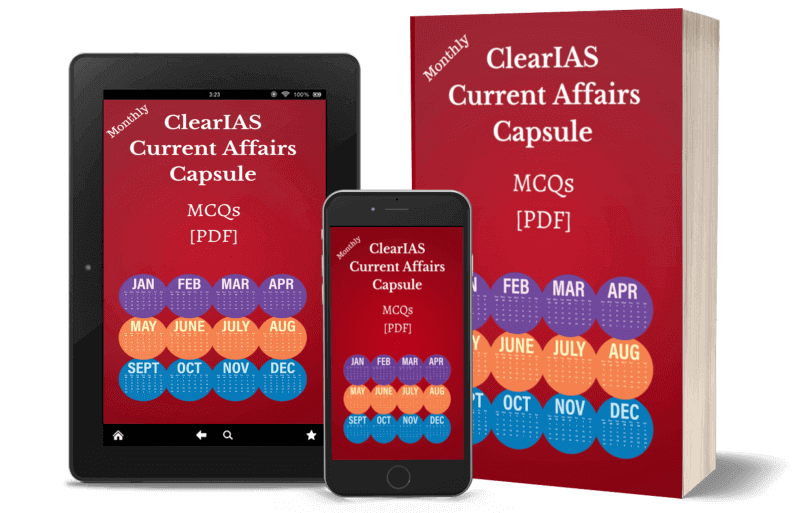 Important Current Events covered via MCQs – ClearIAS Current Affairs Capsules (CCC) are eBooks which contain all important questions (MCQs) based on the Current Affairs for each month. Only 50 MQs Each Month – We hand-pick only about 50 questions for each month, making it very easy for aspirants to learn and revise. Over, a span of 1 year (ie. 12 months), you would get around 600 MCQs for FREE. We have 2 years of CCC available on the store for reference of important back-issues. Quick Learning – As we provide Current Affairs in an MCQ format (with reference links), it makes learning interesting and faster. High chance of similar questions in UPSC Prelims – You may get many questions in actual UPSC Prelims from the CCCs and ClearIAS Prelims Test Series – directly or indirectly. Useful for Prelims (mains and interview) – Though CCCs are designed for Prelims, the Learning Zone in the PDFs is equally useful for UPSC Mains and Interview as well. Downloaded by Toppers – Many UPSC top rankers are regular users of CCCs. The three programs mentioned above are different – even though a few questions may overlap (done purposefully). ClearIAS Current Affairs Capsules (CCC) focusses on monthly MCQs. CCCs cover Current Affairs in general – touching the latest news related to polity, economics, science and tech, environment etc. Some of the good questions from CCCs are included in ClearIAS Prelims Test Series as well, but there will be a lot of additional questions in ClearIAS Prelims Test Series. ClearIAS Email Program includes daily MCQs and other study materials. We email 3 questions on a daily basis to all users to joined ClearIAS Email Program. We have already started the daily MCQs program for 2019. If you are not getting MCQs in your inbox, check if our emails land in other folders like updates/promotions. If yes, move them to the inbox.